Even though Boone is a relative newbie to the Sachi family, it's tempting to label him with the coveted description of "starter Boxer." Of course it's too soon to heap such lofty praise on the handsome brindle boy, but so far we love what we see. 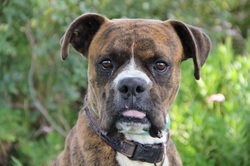 Boone has shown impeccable social skills when it comes to other dogs and is very sweet and affectionate with people. If he tests well with cats then he'll earn himself a hat-trick! If you're looking for a great fit for your home, you couldn't go wrong with Boone on your team!